Located in the pastoral Minnesota River valley just 25 miles southwest of Minneapolis and St. Paul, Chaska has worked hard to maintain its small-town vibe. 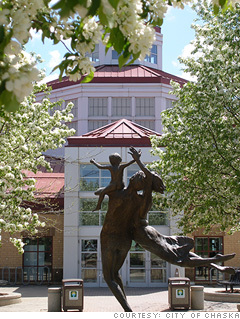 Families gather for summer concerts in the 19th-century downtown; the Chaska Community Center offers a wide variety of activities for residents. The recent completion of Rt. 212 into the Twin Cities has halved commutes and lured new businesses into Chaska, but it has also caused a bump in traffic (and a slight bump in crime). --D.G. Become a Facebook fan of Chaska! Is Chaska a great town, or what?